A dog had to be treated at the scene of a house fire in Nether Kellet after inhaling smoke. 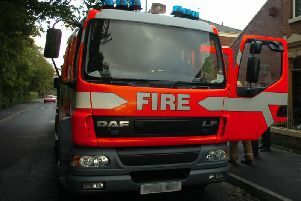 The animal was rescued from the property in Shaw Lane after fire broke out in the kitchen just after 3pm on Monday. Carnforth and Lancaster crews attended the blaze, which had spread from the kitchen to the first floor of the property before firefighters arrived. Crews tackled the fire using two breathing apparatus, a hose reel and a ventilation unit. Firefighters also rescued the pet dog from the property and administered oxygen therapy to the animal at the scene before a vet arrived to check over the animal. There were no other casualties at the scene. Crews were in attendance for about two hours.